Jefferson Pierce hails from the Suicide Slums of Metropolis. At a young age his father is shot by a mobster and before he could succumb to the Suicide Slums like many others, an Italian tailor named Peter Gambi moved into the shop below his apartment and became a father figure to him. Driven by athletics and education, excelling in English and poetry, he makes it to the Olympics at 18. Their he gains media attention having earned some medals. Between some endorsements and scholarships, he is able to attend school over the next four years, double majoring in secondary education and English, graduating with honors. After four years he returns to the Olympics and this time earns a gold in the Decathlon. Able to settle down, he returns upstate to New Carthage to start teaching at a high school there. Following the death of his mother, Jeff returns to Metropolis for the funeral and ends up staying to start teaching in the Suicide Slums. Both to use his Olympic persona to inspire students and the community that they can escape from the Suicide Slums and lead productive lives. In his first year as a teacher at his old high school, he makes an impression by removing a drug pusher from the school. Though in retaliation one of his students is killed. Jeff seeks his old friend and father figure, Peter Gambi. The tailor wants him to continue to fight back against crime because it was a positive influence, as much as him teaching at the school was helping the community. Though he convinces him to take up a costume to protect the students. Peter also helps make a belt capable of generating lightning bolts and a forcefield. 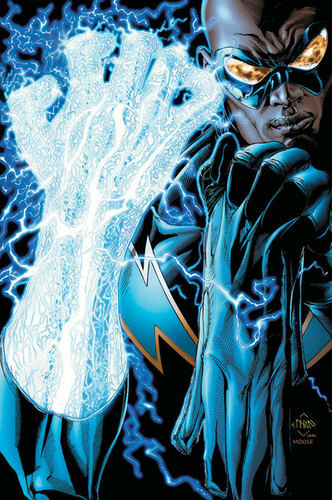 The persona of Black Lightning is born. Starting to make a difference against crime in the Suicide Slums, the costume and belt helps. However, in a twist of fate, the criminals get retaliation against Jefferson. Some having made the connection to his real identity, they come to gun him down while he's meeting with his friend Peter. Peter leaps in front of Jeff to protect him as he doesn't have the belt, the ultimate father sacrifice for his adopted son. Filled with emotion, Jeff discovers his body has managed to internalize the power of Black Lightning from the belt and even enhanced this ability, he survives the encounter and is now metahuman himself with the ability to generate and harness electricity. Determined now, he would not only stop crime to give people a chance, or inspire people, he had to do this to protect them as well. Jefferson is motivated to both education the people of his childhood community as well as protect them. He cannot stop teaching as much as he cannot stop his crusade against the criminals in his poverty stricken neighborhood. At school, he is prone to pushing the kids to their limits, expecting more of them and willing to challenge them instead of give them hand outs. At times this can be seen as hard, but most students benefit from his teaching. To remove as much crime from Suicide Slums as he can so that it is not a barrier to the people of his community. Jefferson feels a lot for his surroundings and the people around him. Prone sometimes to poetry to truly express himself, he has a lot of empathy for the people around him trying to make a better life for themselves. As much as he cares for them, he is prone to over emotion against criminals and others that are robbing an already poor community from any hope it may have. Great care and great anger, depending on whether an individual contributes to that sense of community or hinders it. He believes inevitably, everyone is capable of good if they are shown the right avenue to reach that. Even those criminals he unleashes his anger on can be rehabilitated. Though he takes a tough love approach, one can be shown that they can achieve goodness and elevate themselves and those that do not just need a good jolt to wake them up. Sometimes, literally, a good jolt. Because of Peter, Jefferson will do his best not to fail in life. He was driven towards athletics, and is driven in his personal career to make the school he works at a better place. If he doesn't succeed at first, he definitely has to try again and change his tactics to get there. There is always a way. 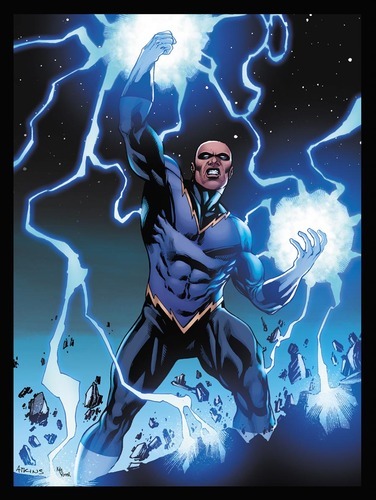 Black Lightning can generate raw electricity from his body and manipulate for various effects. He can also sense other sources of electricity which he can draw from as well, working as a natural power plant. As such, he can charge electrical devices if necessary as well as drain them. All his powers derive from this ability. He can project electricity through his hands. Capable of stunning or harming others, he is capable of ionizing the atmosphere around him to create even higher electrostatic discharges. Individual bolts are at the high end of lightning output, billions of volts of electricity. With more power from an external source, he is capable of producing deadly storms that could generate 100s of lightning strikes per minute even. He can fly by charging his lower body with electricity. The upper end of speed has never been tested and he can hypothetically travel at the speed of light. Able to produce a personal forcefield, this is capable of deflecting bullets. It can sustain high levels of impact, including missiles, explosives, artillery fire and physical attacks from most metahumans (up to 1,000s of tons of force, but not into the 10s of thousands on the level of Power Woman, Superman, etc.). This is also capable of absorbing high levels of energy, short of upper end gamma level on the electromagnetic spectrum. He can become pure electrical energy which he can use to travel through wiring and other elements capable of conducting electricity. Again, in this mode and through a conduit he can travel, hypothetically, at the speed of light. Literally at the speed of light, though this doesn’t make him capable of actually running that fast, only quickly on a personal immediate area/level. 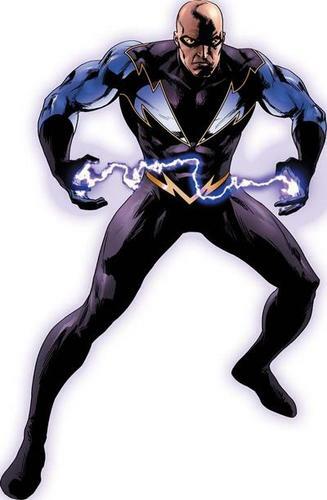 Black Lightning can absorb electrical energy, as he can displace it as fast as he takes it in, there is no known limit to how much he could hypothetically absorb this way. He is able to track the broadcast frequency of electricity to its source. This would include lightning immediately after it strikes, but given a few minutes for the particles of lightning to diffuse this becomes to subtle for his tracking ability to work. 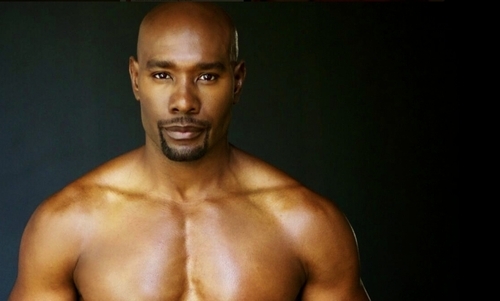 A combination of his former teaching career before returning to Suicide Slums as well as continued endorsements stemming from his gold medal in the Decathlon, he maintains a high standard of living. Not wealthy, a billion miles way from even being noticed by Hell Fire Club, he's certainly not want for much in his life. Being a gold medalist in a difficult event, he is famous. While wanning slightly, he can go to a lot of areas, especially outside of the Suicide Slums and be recognized. Especially anyone who might use a product that he has endorsed, from shoes to cereals. He has trust from the broader public school system of Metroplis and is on a first name basis with the superintendent of the schools. Some of his policies for education students is being adapted to a broader scale in the system. A highly educated (Kent University Double Major with Honors) and skilled teacher. Having turned around the decaying high school in Suicide Slums, he is quickly making a name for himself to the city of Metropolis at large and even to more in more distant schools in poverty stricken areas. He may well be the nation's best educator. He is at peek physical conditioning for a human, strong and athletic. He is also highly acrobatic do to the training required to master so many different events and compete in the Decathlon, many of his other medals are in individual sports. He is a skilled street fighter. This would at best make him capable of low level MMA but no where near professional level. He could certainly use more training in this regard - relying on his powers while fighting crime in the Suicide Slums. 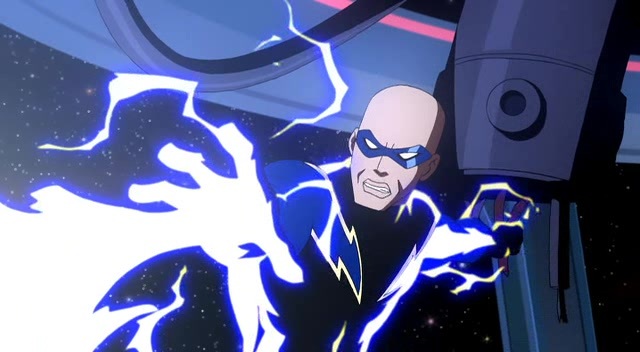 Despite being skilled in fighting, he is dependent on his electrical powers while fighting crime. Even while being a generator of electrify that can absorb more from other electrical devices, there is a potential that something external could drain him. This has yet to be seen, but it could happen. Because he is more famous as an athlete and being more recognized for the amazing work he is doing as an educator, this leaves a great many targets to anyone who ever figures out his identity. Students and colleagues to anyone he might have a relationship with. Choosing to target criminal organizations also means there are more enemies that could come for him - or for those he is trying to protect. His enemies are criminal organizations and, while not always assocaited with metahumans, their sheer numbers pose a threat. The more serious of a threat he becomes to them, the more likely they are to use the power of there numbers against him. The people of his community are his primary concern. They take precedence over anyone else. Should he grow in fame or popularity as a metahuman, this could be a hindrance as instead of the greater picture he is more inclined to think of the people in his community first and foremost. He does want to help as many people as he can, but he will prioritize if he deems it necessary. The upper end of his powers do presently tend to drain him. This would include the force field and the potential lightning storm at 100 strikes a minute. For stopping bullets or normal physical damage, this isn't noticeable. However, while he might take a low high end punch or two from a meta, he'll become drained without having a source to draw from. Even with a source, taking a hit from someone like Thing or Colossus will leave him vulnerable do to power drain. 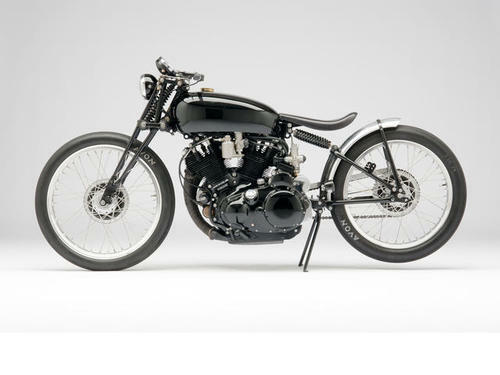 Vincent is the name of a British company that made motorcycles. They had bought out another company (HRD) in the 1940s. Black Lightning was one of their stock bikes. This bike was specifically designed for one rider and speed. 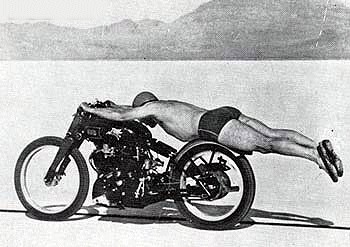 Not only did it have a speedometer that went up to 150 mph, but Rollie Free rode the bike at Bonneville Salt Flats in 1948 and, after stripping down to his trunks and lying down on the bike, managed to top 150 mph. With a few modifications, it topped 180 and held the world land speed record for bikes until the mid-50s when Vincent motorcycles went out of business. Its the last production bike to go that fast (150 mph) until the 1970s and is often associated with the idea of the cafe racers of the 50s.